You have Black Friday, which is the most popular shopping day of the year and is the starting point of the Christmas holiday shopping season. But then you have Cyber Monday. Cyber Monday is the day where, supposedly, the deals all shift over to the web and people flood retailer’s websites looking for rock bottom prices. One place I can tell you already that has a great store-wide deal going online is Ace Hardware’s website. 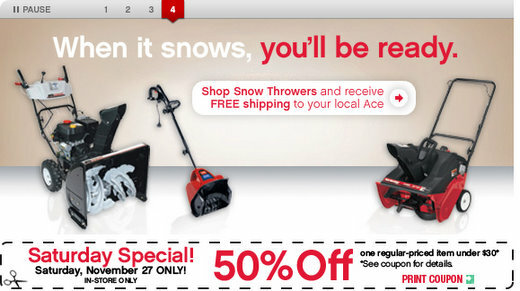 Simply visit the Ace Hardware website, print out the front page, and cut out the 50% off store wide coupon. This 50% off applies to any purchase $30 or below and is only available on Saturday, November 27th.